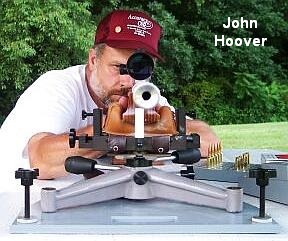 Shooting a 6.5×284 with Sierra 142gr Matchkings, John Hoover won the Two-Gun Overall Championship at the 2010 Williamsport World Open this past weekend. Hoover, whose tack-driving 6.5-284s have been featured on this website, operates Accuracy One Shooting Supplies in Tyrone, Pennsylvania. John shot consistently, placing 3rd overall in Light Gun class, and 6th in Heavy Gun to win the overall Two-Gun with 34 rank points. Paul Chackan finished second in the Two-Gun with 59 rank points, and Matthew Kline was close behind with 60 rank points. Our own Assistant Editor Jason Baney finished 5th in the Two-Gun Overall. Jon Ammerman shot brilliantly to win the Light Gun division, finishing first in Group (7.161″ Agg), and third in Score (95.00 Agg). Runner-Up in Light Gun was Mike Bonchack. Interestingly, according to the equipment list, both Ammerman and Bonchack ran a mid-sized 6mm cartridge in Light Gun. Jon shot a 6XC while Mike shot a 6×47 Lapua. Both rifles were smithed by Sid Goodling. 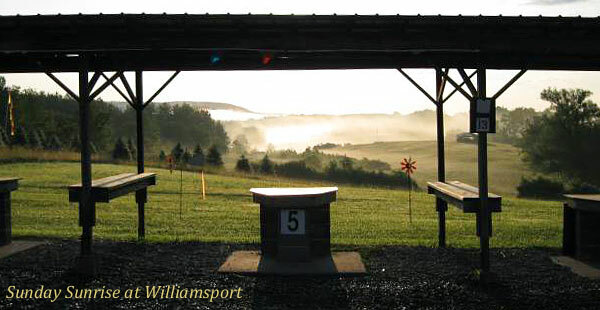 CLICK HERE for Complete 2010 Williamsport World Open Match Results (with equipment lists). We had beautiful weather this year. It poured rain Friday night, but the humidity disappeared by early morning on Saturday. We had 30% relative humidity on Saturday — Pennsylvania is rarely that low. We had sun pretty much all day on Sat and Sunday, with highs of 91° each day. Winds were sometimes difficult …as usual. 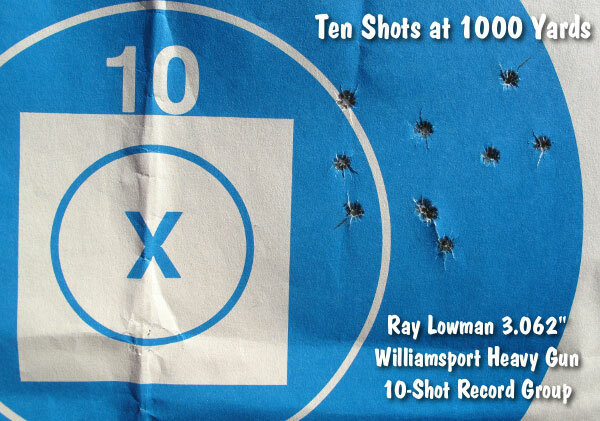 We had a new 1000-yard Williamsport record in Heavy Gun, Ray Lowman’s 10-shot 3.062″. Though .018″ larger than Joel Pendergraft’s IBS Record, Lowman’s 3.062″ is still the smallest 10-shot 1K group ever shot at Williamsport. (My buddy Scott Leitner shot a 4.3″ — the second smallest HG group of the weekend.) 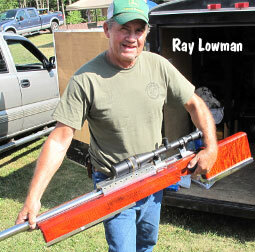 Here are details of Ray Lowman’s 80-lb HG rig: .308 Norma Magnum, Nesika action, Benchmark barrel. For his load, Ray used Reloder 22 and Federal 210M primers, behind Knight 200gr bullets. Ray pointed his bullets until nearly closed, then he trimmed the meplats. Ray’s gun was smithed by his son Shannon Lowman. The 32″ barrel now has 1500 rounds through it and has been set back twice before (it started life at 36″). I shot the third smallest group of the weekend, but blew it the first day in LG with a 14″ group…went vertical. Shooting my 6BR in LG, I was at the top of my powder window expecting 70 degrees (as predicted by the weather service), not 90 degrees. Oh well, I shot decent in HG, using Mark King’s HG the relay after him each day — this is the same Dasher-chambered gun Mark won with last year. Share the post "Hoover Wins Williamsport World Open — Many Impressive Results"